Updated Tuesday January 23, 2018 by Stan Dorsey, Mike Guillfoyle. 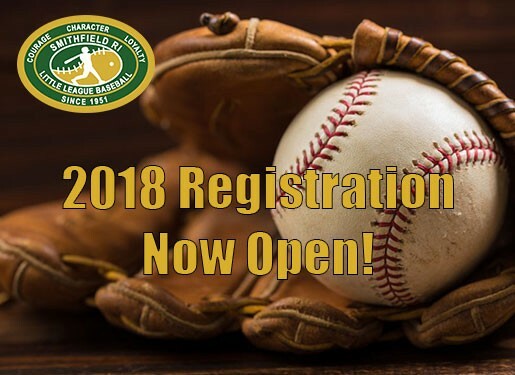 Smithfield Little League today announced that registration for its 2018 spring season is now open to all Smithfield children born between Sept. 1, 2001, and Aug. 31, 2013, to register for an exciting season of baseball. Registration will close on Sunday, February 16. Skill evaluations will be held on Sunday, Feb. 25 for 9-12-year-olds, and Saturday, March 4, for 7-8-year-olds, at a time and location to be determined. All players who register are assigned to a team, regardless of playing ability. Depending on the weather, practices and games will begin in April. Following the installation of lights last summer at the Whipple Field complex, this season promises to be one of the most exciting in the league’s 67-year history, as night baseball makes its official debut in Smithfield. Children of all experience levels are invited to register for a season where they’ll learn proper game fundamentals, grow as players, develop new friendships and have plenty of fun in the process every time out. The League is proud to again offer the Challenger Division which, according to Little League Baseball, was established in 1989 as a separate division to enable boys and girls with physical and mental challenges, ages 4-18, or up to age 22 if still enrolled in high school, to enjoy the game of baseball. Smithfield Little League is among more than 900 Challenger Divisions worldwide with more than 30,000 participants.